FC Barcelona B win at the tough away ground of Tenerife (1-3). The blaugranes, who defended excellently, secured the win thanks to a great first half hat-trick from Carles Pérez. The second half was tough and proved how hard it is to get a result away to Tenerife but the blaugranas dug in and became the first team to leave with the three points this season. 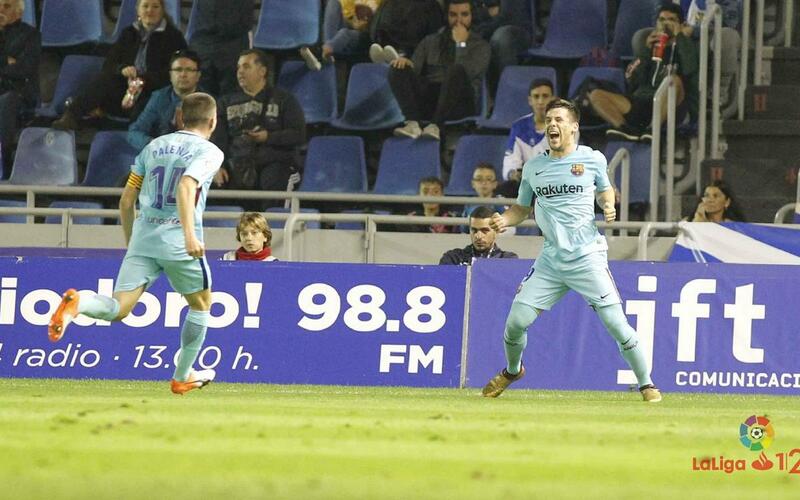 Tenerife started brightly but Barça B took the lead with their second chance of the game. First, Ortolá saw his effort saved and then Carles Pérez opened the scoring following an assist from the debutant Rivera in the ninth minute. The goal gave the blaugranas confidence and they doubled their lead in the 15th minute. Carles Pérez once again got the goal which was laid on by Lozano. Barça B were clinical in a game which they weren’t dominating completely. Tenerife missed a penalty and then went 3-0 down as Carles Pérez finished off a fine individual move to secure his hat-trick in the 36th minute. The blaugranes focused on defending well in the second half and they managed to do so excellently. The result was not in doubt as they closed down the game effectively despite conceding once with thirteen minutes to go. Gerard López’s side secured an excellent away win at a ground which no visiting side had managed a victory this season. The result breaks a run of four winless games. The blaugranas next play at the Miniestadi against Granada.